Generation and characterization of Scn2aA263V channelopathy mice. (A) Scheme of the targeting strategy of knockin mice carrying the human p.Ala263Val gain-of-function mutation in the Scn2a gene (left), and a representative image of PCR genotyping of wild-type, heterozygous (M/+), and homozygous (M/M) knockin animals (right). The lanes are from the same gel but were noncontiguous. (B) Quantitative real-time PCR of mouse Scn2a transcripts normalized to TATA-box-binding protein transcripts from wild-type and M/+ mutant whole spinal cord (n = 2 per group) or whole spleen homogenates (n = 2 per group). ΔCT values were arbitrarily calibrated to CNS cDNA of wild-type mice as the standard value of 1. Data are shown as mean ± SEM. (C) Western blot of cortical cell membranes from wild-type and M/+ mice at 3 weeks of age, demonstrating comparable abundance of NaV1.2 protein. The lanes are from the same gel but were noncontiguous. 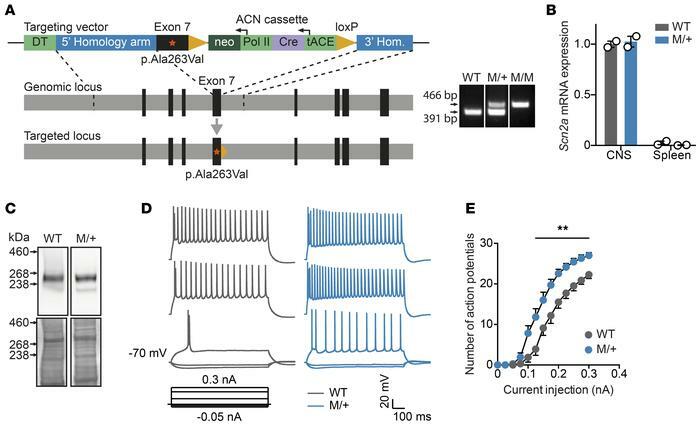 (D) Representative traces of current-clamp recordings from P10 to P12 hippocampal CA1 pyramidal neurons of wild-type and M/+ mice (injected currents from bottom to top trace in nA: –0.05; –0.025; 0.1; 0.225; 0.3). (E) Number of evoked action potentials plotted against the injected current. Wild-type: n = 10 cells from 2 animals; M/+: n = 15 cells from 3 animals. Data are shown as mean ± SEM. ; 2-way analysis of variance (P = 0.0037 for genotype effect) was used for statistical analysis; **P < 0.01.